"eCampus.com is delighted to partner with Miami University to provide their students with an innovative way to order all of their textbooks and course materials at competitive prices and receive FREE one-day shipping on every order without a pricey membership fee. The virtual bookstore model saves students a significant amount of time and money, the two most important things to today's college students. As a result, the business of selling and renting physical books in university brick and mortar stores is becoming obsolete." Easy access to ordering through Miami's intranet, myMiami, and the Miami bookstore website. David Creamer, senior vice president for finance and business services for Miami, said, "Miami continues to find ways to rethink many of its business practices to better serve our students. Many students already buy textbooks through online services, and eCampus.com can facilitate their efforts faster with convenient delivery and customer support." "Schools across the nation are now finding it imperative to rethink the "book" in bookstore as they are facing stiff competition from online retailers like Amazon, Chegg and eCampus.com. Miami University has taken a practical step forward by selecting eCampus.com as its sole textbook provider, ensuring their students will receive the best possible ecommerce shopping experience at the most competitive prices." eCampus.com is a premier online retailer of new, used and electronic textbooks for sale or rent, study materials, and book buyback services. The website launched on July 2, 1999, the birthday of original investor Dave Thomas of Wendy’s, and pioneered the selling of used textbooks online. Unlike other dot-com companies at the time, eCampus.com's executive team brought with them invaluable experience in the textbook industry. The company has repeatedly found success in their ability to be agile and innovative, adapting to the ever-changing textbook market. eCampus.com's mission is to set online bookstore industry standards for savings, selection, convenience, and customer service as expressed in its slogan "Textbooks Easy. Fast. Cheap!" eCampus.com, an industry-leading online retailer of textbooks and digital materials, has announced that it has completed the transaction to acquire the digital assets of Rafter, a course materials management company. The purchase of Rafter digital assets further enhances eCampus.com's ability to provide students with 100 percent of their assigned print and digital materials. For one predictable and low flat rate, students will receive all required course content, including textbooks, workbooks, novels, access codes, and eBooks. The program enables students to save on average up to 50% or more off of current textbook costs. By leveraging a portfolio of newly acquired Rafter assets, including Rafter360 software, trademarks, Rafter.com, Rafter IQ, and additional patents and resources, eCampus.com will provide colleges and universities with the most versatile and cost-conscious course materials management options. The Rafter purchase will expand and compliment eCampus.com's existing one-price models for K-12 and higher education by now offering this innovative program, known as eCampus.com ALL Access, as an available option within their Virtual Bookstore Division. This enhanced service reflects eCampus.com's desire to simplify the growing complexity of managing course materials for its partners while meeting the demands of an ever-changing digital culture. "The textbook delivery and management landscape is changing as institutions with traditional bookstores are facing stiff competition from online retailers like Amazon, Chegg, and eCampus.com. Through the purchase and repurposing of Rafter assets, the eCampus.com ALL Access program is helping higher education reduce costs, simplify the complexities of textbook procurement, and eliminate the classroom challenges of limited course material access. Students will enjoy significant cost savings - more than 50% - off of their current purchasing methods, complete with flexible delivery options. Faculty equally benefit from the program's intuitive adoption tool that allows professors the academic freedom to easily discover and adopt both print and digital materials regardless of publisher or platform." The eCampus.com ALL Access program provides unrivaled options for higher educational institutions to meet the demands of rising textbook operational costs. By including the cost of all course materials in tuition, eCampus.com ALL Access will simplify the textbook purchasing dilemma for students and level the playing field by ensuring all students have the correct materials at the right time. Students having course materials on the first day of class is a key indicator for success and retention. Through ALL Access, institutions will ensure student success from day one. eCampus.com has successfully transitioned 8 out of 12 former Rafter customers to the ALL Access program. "This is a fantastic model for purchasing required course materials for campus success," said Montgomery. "Our unmatched customer service is evidenced in our attention to detail, including how we individually package, label, and deliver course materials by student name, alleviating the challenges of bookstore personnel performing warehouse functions on site. Our program increases affordability, promotes improved retention, and gives our partner institutions the freedom of choice when it comes to the best available content." The purchase remains subject to customary closing conditions. To learn more about the eCampus.com ALL Access program, visit http://ecampusvirtualbookstore.com or contact Daniel Ayers, VP of Sales, at dayers(at)ecampus(dot)com. eCampus.com is a premier online retailer of new, used, and electronic textbooks for sale or rent, study materials, and book buyback services. The website launched on July 2, 1999, the birthday of original investor Dave Thomas of Wendy's, and pioneered selling used textbooks online. Unlike other dot-com companies at the time, eCampus.com's executive team brought with them invaluable experience in the textbook industry. The company has repeatedly found success in their ability to be agile and innovative, adapting to the ever-changing textbook market. eCampus.com's mission is to set online bookstore industry standards for savings, selection, convenience, and customer service as expressed in its slogan "Textbooks Easy. Fast. Cheap!" Since 2002, the eCampus.com Virtual Bookstore Division has enabled colleges, universities, and K-12 schools to streamline their textbook fulfillment processes while allowing students to obtain all of their course materials through an online virtual bookstore. The company has perfected their Virtual Bookstore model, which is powered by proprietary software that is unrivaled in the online textbook industry. The eCampus.com Virtual Bookstore Division currently serves as the official bookstore for over 250 institutions nationwide, with growth experienced each year. eCampus.com has announced their partnership with the University of Wisconsin-Milwaukee. The seasoned Virtual Bookstore professionals were chosen by the University to develop UWM's first-ever Virtual Bookstore that will be live at the end of fall semester. The University's 28,000 students will receive free two-day shipping on all orders placed through the UWM Virtual Bookstore without having to pay pricey membership fees. eCampus.com's premier internet pricing model has the ability to adjust textbook prices based on actual market pricing, making certain that students are saving as much money as possible. Students are expected to save up to 60 percent on their textbooks and materials, with potential yearly savings of $480 per student. "eCampus.com is thrilled to bring our invaluable experience and seamless Virtual Bookstore model to theUniversity of Wisconsin-Milwaukee to launch the first-ever UWM Virtual Bookstore," says Matt Montgomery, President and CEO of eCampus.com. "Virtual Bookstores are the most efficient and cost effective way to deliver books to students, allowing students to bypass waiting in long lines and enduring high textbook prices." "We are very excited about the new relationship between UWM and eCampus.com. This partnership will enhance student success by making textbooks and course materials more affordable for students," said Michael Laliberte, UWM's vice chancellor for Student Affairs. "Additionally, this new model will provide students with added incentives to reduce their costs of purchasing textbooks." To compliment the UWM Virtual Bookstore, eCampus.com has created an exclusive rewards program for UWM students, faculty, parents, and alumni. Students are rewarded with Virtual Bookstore in-store credit for purchases they would already be making from a variety of over 300 popular online retailers. It is currently the only rewards program to offer students a way to earn free textbooks. eCampus.com will also be providing the University with textbook scholarships, general scholarships, event sponsorships and campus promotions. In addition to the UWM Virtual Bookstore, eCampus.com is implementing the eCampus.com Store@UWM that will be housed in the University's Student Union. The store will be fully staffed with employees to assist students in the ordering of their textbooks and materials. Students can place orders, pick up orders, sell textbooks and return textbook rentals at the eCampus.com Store@UWM or order online through the UWM Virtual Bookstore 24-7-365 to have their textbooks and materials delivered directly to their doorstep. "This program offers savings to students that just wouldn't be possible with a brick and mortar bookstore," saidScott Peak, UWM's executive director of Auxiliary Services. "Schools across the county are going to be moving to online book sales because it is so cost-effective. With the traditional model, bookstores spent large sums shipping books they didn't always sell and that cost got passed on to customers. This new model is student-friendly and ensures the only books being shipped are those students want and need." "Virtual Bookstores are the future of higher education," adds Matt Montgomery. The UWM Virtual Bookstore is the first of its kind for the University. The eCampus.com Virtual Bookstore Program currently serves as the official bookstore for over 150 schools nationwide. As Wisconsin's only public urban research university, UWM has established an international reputation for excellence in research, community engagement, teaching and entrepreneurism. UWM educates more than 28,000 students on an operating budget of $705 million, including federal financial aid passed through to students. The Princeton Review named UWM a "2015 Best in the Midwest" university based on overall academic excellence and student reviews. An engine for innovation in southeastern Wisconsin, UWM's economic impact is more than $1.5 billion per year in Wisconsin alone. eCampus.com is a premier etailer of new, used and electronic textbooks for sale or rent, study materials and book buyback services. The website launched on July 2nd, 1999, the birthday of an original investor of the company, Dave Thomas of Wendy's and pioneered selling used textbooks online. Unlike other dot-com companies at the time, eCampus.com's executive team brought with them invaluable experience in their industry. The company has repeatedly found success in their ability to be agile and innovative adapting to the ever-changing market. eCampus.com's mission is to set online bookstore industry standards for savings, selection, convenience and customer service as expressed in its slogan "Textbooks Easy. Fast. Cheap!" July 2014 marks fifteen years of business for Lexington-based company eCampus.com. To celebrate this exciting milestone, the textbook etailer launched a nationwide sweepstakes that began Monday, July 28th and will run through Friday, September 12th. With no purchase necessary, one Grand Prize Winner will be awarded an eCampus.com themed 2014 Jeep Wrangler on or around September 23rd. This nationwide sweepstakes is reminiscent of past eCampus.com promotions. In 1999, the company's founding year, eCampus.com ran a similar promotion titled the "Wanna Winna Hummer" Sweepstakes – giving away a fully-loaded Hummer H1. After winning the sweepstakes, Daniel Drawe, a graduate of Southern Utah University, screamed "This is like winning the lottery!" A reaction deemed memorable by eCampus.com. Originally supported by investors including Wendy's franchise founder, Dave Thomas, eCampus.com quickly achieved industry recognition by offering one of the largest selections in used textbooks. The company expanded a new division in 2002, the Virtual Bookstore program, that currently serves as the official bookstore for over 100 schools nationwide. In 2008, eCampus.com was among the first online college bookstores to provide electronic textbooks (eTextbooks) and in 2009, eCampus.com was also among the first to allow students to rent their textbooks. Most recently, in 2013, eCampus.com launched eTechCampus, a full 1:1 consulting service that implements a digital learning solution and houses the largest digital library in the country. "Our success is driven by our ability to adapt in the ever-changing market. It is rewarding enough to remain a leading competitor in this industry," said Montgomery, "I am proud of all the employees who helped us accomplish such a milestone. We appreciate our loyal customers and we look forward to continuing our success in the years to come." 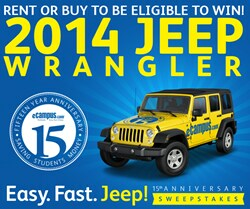 For the Official Rules of the 15th Anniversary Sweepstakes, please visit www.ecampus.com/jeepsweeps. The eCampus.com Marketplace can pay their Marketplace sellers hundreds of dollars while providing an avenue to sell unused books sitting in the bottom of a closet. Sellers may have fifty textbooks in their closet, or they may have ten-thousand, in which case the payout is even sweeter. The eCampus.com Marketplace, as a limited time offer, is awarding high-quality, high-volume textbook sellers who register before July 1st, 2014 a reduced commission rate of 14% for three months. This commission rate is the lowest of all online marketplaces, beating competitors such as Amazon and Barnes & Noble. This offer allows sellers to keep more of their earnings in historically busy months: July, August and September. The low commission rate sweetens the deal sellers get when they register for the eCampus.com Marketplace as a preferred seller. The revamped Marketplace features a number of innovative developments to save sellers time and money. Sellers are now offered a bulk buy option, real-time reporting and an intuitive dashboard. With no variable closing costs or sign up fees and increased shipping stipends sellers earn more on each sale. eCampus.com is looking for high-quality, high-volume textbook sellers to join the Marketplace and enjoy the reduced commission rate. Register for the eCampus.com Marketplace today to experience one of the industries best Marketplaces. For more details on how to become a preferred seller for the months of July, August and September and receive the limited time low commission rate please contact sellbooks@ecampus.com. Nearly all in stock textbooks will be available to rent for only $20 just in time for students' upcoming midterms and finals. In an effort to help students who didn't buy textbooks at the beginning of the semester save money, eCampus.com's Midterm Mania Sale will offer them the chance to rent any in stock textbook for only $20 while supplies last. The sale, beginning this week, comes just in time for most universities' midterm and final exams. "This time of year is stressful enough for students without the added pressure of purchasing an expensive textbook," says Matt Montgomery, President and CEO of eCampus.com, "We hope that by offering our Midterm Mania Sale students will have one less thing to worry about during this busy time." At a time when most students are just realizing they need a textbook they never purchased in order to do well in a class, eCampus.com's continuous commitment to better serve its' customers is more important than ever. Many students forgo buying textbooks during peak buying times because they feel that they are too expensive and don't want to waste their money. However, it isn't until later that some realize that having a book to study with really is worth the money. "Our dedication to our customers isn't limited to the months of August and January when most students order their textbooks," explains Montgomery, "We understand that each student has different needs and our goal is to meet each of them to the best of our ability. With this sale, we are dropping our prices drastically so students can ace their midterms and finals without overpaying." eCampus.com, named Best Website for Buying College Textbooks by About.com, is offering this sale on textbook rentals because they understand that more students prefer renting textbooks over buying them. According to students, textbook rentals are the most convenient and inexpensive way to buy books. The Midterm Mania Sale aims to cut costs of this already cheap alternative, something many textbook sites are unwilling to do because their main goal is profit rather than customer commitment. Students can visit eCampus.com and click on the Rent Textbooks link to get started on saving money. In preparation for the fall semester, eCampus.com has implemented an improved site design that will make it easier for college students to buy, sell and rent textbooks. In a continuous effort to better serve its customers, eCampus.com, a leading internet retailer, implemented a new website design last week that will create a smoother shopping experience. This redesign falls in line with the company's focus to provide students with textbooks as easy, fast and cheap as possible. With enhanced navigation and an intuitive new layout, eCampus.com continues to position itself at the forefront of the online textbook industry. Matt Montgomery, President and CEO, believes this redesign will allow eCampus.com to keep up with the everchanging needs of its customers, "Whether it's immediate access to eTextbooks or more textbook rental options, we have worked hard to create a site that will provide students with the solutions they need for an improved college experience." Over the next few weeks, as college students begin their courses, they will turn to eCampus.com as an affordable alternative to their traditional college bookstores. Other site enhancements include a face-lift for the eCampus.com eWards Loyalty Program, which has boasted over 25,000 members since its launch in August 2012, along with a new interactive Help Desk that will allow customers to search effortlessly for detailed order information and helpful answers to other FAQs. eCampus.com is confident that these changes will allow for an improved shopping experience for those college students looking for the widest selection of textbooks at the lowest prices. 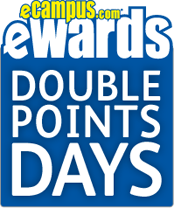 Today marks the first of several eCampus.com exclusive eWards Double Points Days, allowing students to save even more money on college textbooks. With its launch of eWards in August, eCampus.com has become the first and only rewards program for textbooks. The program has been expanding rapidly since its start, with up to 2,000 new member enrollments each week and nearly 5 million points awarded to students, which are redeemable for huge savings on future textbook and college clothing orders. eWards members always receive 1 point for each dollar they make from selling textbooks, but for one week only, April 29-May 6, members will receive 2 points per dollar. This promotion is the first of several, which will run throughout the summer and fall. Future Double Points Days will reward students for other actions, such as renting textbooks. Matt Montgomery, President and CEO of eCampus.com, expresses excitement about the program's new promotions and plans for expansion. "We've been working to implement several new features that will bring our customers the best deals and most valuable rewards." He admits that students don't enjoy spending money on textbooks, "We always try to make buying textbooks as easy, fast and cheap as possible for students and now, with eWards, students will get additional savings just for buying the things they need." Signing up for eCampus.com eWards is easy and free, and accounts are automatically linked to the student's email address so there is no need for a rewards card or account number. Members receive 50 points just for enrolling and are encouraged to collect more points by referring new members, emailing deals to friends, placing an order, and more. eWards members can exchange points at any time for their choice of several rewards, including free shipping and $25 off. For a complete list of rewards, and to enroll in the program, visit https://www.ecampus.com/ecampus-ewards. eCampus.com proudly defends its title in 2013 as Best Website for Buying College Textbooks, awarded yesterday by About.com. The polls were open from February 19 to March 19 and voting was made available to the public. Thousands of votes were submitted over the course of the month, but eCampus.com had a clear lead over the competition from the start. After winning this award in 2012, eCampus.com launched eWards, making it the only online textbook retailer to offer a loyalty program. "It is such an honor to receive this award once again this year. We truly appreciate all the support and positive feedback our customers have given us. eCampus.com is the oldest textbook focused e-retailer in the country and we have saved students more than $80 million since we were founded in 1999. We work hard to bring great deals and service to our customers and it's always gratifying to receive recognition," explains Matt Montgomery, President and CEO of eCampus.com. As more and more students move away from university bookstores online alternatives become the trend. Many new textbook sites emerge, but many of these start-ups may be risky and unreliable. It's difficult for students to know which sites to trust, but Readers Choice Awards like this one point students in the right direction. 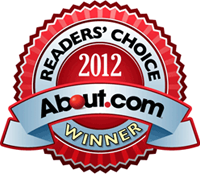 The About.com Readers Choice Awards are given annually and chosen by the readers to announce the best of the best. These awards give customers a chance to share their knowledge and preference for a variety of products and services. The Best Website for Buying College Textbooks award aims to help students figure out which sites are used and trusted by their peers. eCampus.com creates an infographic based on U.S. News & World Report's Best Graduate Schools 2014 guidebook to aid students in making post-grad decisions. The guidebook, which will be in stores April 9 but is already on sale at eCampus.com, is composed of a variety of articles written by education journalists, as well as U.S. News' exclusive graduate school rankings, which consider factors like admissions rates and students' success. The infographic, Best Grad Schools: Inside the Guide, takes critical information from the guidebook and converts it into a meaningful visual for students to consume easily. Similar to the previous grad school infographic, the 2014 edition examines information selected from the five major professional graduate schools: business, health and medicine, law, engineering, and education, but has also included a section entitled "Virtual Path", dedicated to the growth in popularity of online graduate programs. Anne McGrath, Managing Editor at U.S. News & World Report, discusses how the book's rankings, highlighted in the infographic, can aid students on the path to selecting a graduate program. "In this year's guide, we explore how degree programs are becoming more practical; to better prepare graduates to land good jobs. Whether you're weighing an M.B.A., a law degree, a master's in engineering or education or a Ph.D. in physics, the advice and exclusive Best Grad School rankings we present in this book will help you make the smartest, most informed choices." As the economy recovers, so does the job market, allowing new opportunities to emerge. However, many of these open positions will require candidates to have more than an undergraduate degree. By looking at trends across a spectrum of fields, students will be better equipped to selecting a career path that will pay off. Matt Montgomery, President and CEO of eCampus.com, is confident that students will find value in "Best Grad Schools: Inside the Guide". "Graduate school is a serious financial consideration, and the facts presented in this infographic shed light on academic trends and potential returns on an educational investment in a practical format that students can understand. Our focus has been the same since 1999: to save students time and money. From providing cheap textbooks to presenting critical information regarding post graduate options, we are always working to make students' lives easier." The Best Graduate Schools 2014 guidebook is available to purchase at eCampus.com for $8.95, which is cheaper than other outlets. The full infographic is below. eCampus.com and Dorm Co have joined forces to give away a $1,000 "Dorm Room Makeover", as well as 29 other daily prizes. It's all part of eCampus.com's 2nd Annual EZ Living Sweepstakes. Entries are being accepted from August 14 through September 12; prizes are awarded daily from August 15 through September 13. Entering the competition is free and available via a tab on eCampus.com's Facebook page that reads "Enter Now." EZ Living Sweepstakes prizes increase in value daily and range in price from $3.00 to $1000.00. Prizes include an alarm clock, a space saver multi-hanger, a plush rug and a college fridge/ freezer combo. Launched on August 6th and running concurrently with the 2nd Annual EZ Living Sweepstakes promotion, the "Show us your eCampus" competition encourages users to stick their eCampus stickers in likely and unlikely settings, capture a photo, and share it via Twitter or Instagram using the "#myecampus" hashtag. Prizes include an iPad, Nikon camera or a $300 textbook scholarship. The last day to enter is September 30 and winners will be announced on October 1. Entering the "Show us your eCampus" contest is easy, since every shipped order contains an eCampus.com sticker. Once customers stick the logo in the desired location, take a photo and upload it they are entered to win. According to CEO Matt Montgomery, these promotions are part of an ongoing celebration. "In light of the back to school season, eCampus.com and Dorm Co wanted to say ‘thank you' to our loyal customers who have made us who we are over the years," explained Montgomery. "Our sticker campaign is a fun way for customers to win prizes by sharing images using playful social media tools." Since 1999, eCampus.com has been the trusted source for cheap new and used textbooks, followed by eTextbooks and rentals. eCampus.com and the creators of "The Mindset List" have teamed up again to visually represent the state of mind and situation for this year's incoming freshman: the Class of 2016; a world where during their lifetimes, suitcases always had wheels, and two-thirds of the independent bookstores in the United States had already closed for good. Since 1998, Beloit's former Public Affairs Director Ron Nief and Keefer Professor of the Humanities Tom McBride, have captured significant insights into the "givens" of a student's life. The list, which reveals through startling facts just how different life is experienced across generations in the face of changes to technology and culture, is available in its entirety through the project's website, which also serves as a resource for educators and counselors. Are you hip enough to predict the latest changes? Take the quiz on The Mindset List's Facebook page here. eCampus.com frequently invests in content that educators, counselors, parents and students alike can use and has turned The Mindset List into a key document in its gallery of infographics, which relate to important aspects of student life. In addition to publishing these infographics, eCampus.com now sells and rents the book co-authored by Mr. Nief and Mr. McBride entitled The Mindset Lists of American History: From Typewriters to Text Messages, What Ten Generations of Americans Think Is Normal . This book takes the "Mindset List" approach and dramatizes what it was like to grow up in every American generation since 1880, showcasing the remarkable changes that help determine what we consider to be normal over the years. The "Mindset List" has received praise from NBC Nightly News and The Seattle Times. Additionally, it has received news coverage by CBS News, Boston Globe, Chicago Tribune, USA Today, and Fox News as well as various international publications. In 2009, TIME magazine declared the mindset list was a new phrase in the American Lexicon. It is released every year in mid August via webcast and press release. 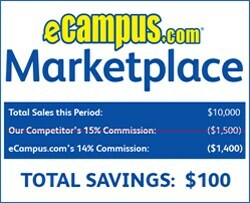 Eighty percent of college students said that eCampus.com, a leading online textbook retailer, has the best prices. Since 2009, students have saved more than $20 million by renting their textbooks books from eCampus.com, which has more than 3.2 million titles to choose from. Each year, nearly 280,000 college and high school students trust eCampus.com to deliver the best value on textbooks and other merchandise. Due to its price value-based philosophy, eCampus.com won the 2012 About.com College Life Readers' Choice Award for the Best Website to Buy College Textbooks. "We are thrilled that consumers recognize our value," said Matt Montgomery, eCampus' CEO. "We work hard to deliver textbooks in the easiest, fastest and cheapest way possible to our customers." According to "Trends in College Pricing 2011," a report from the College Board Advocacy & Policy Center, the average student spends $1,168 per year on textbooks. The U.S. Government Accountability Office stated that since 1986, college textbook prices have risen at twice the rate of inflation. These recent trends further reflect the efforts made by students and parents who search aggressively for new ways to save money. Responding to an annual eCampus.com survey investigating college students' textbook purchasing and reading habits, respondents overwhelmingly stated that cheaper prices were why they purchased books from eCampus.com. Seventynine percent of responders stated that they preferred to rent rather than buy their textbooks. eCampus.com estimates that textbook rentals typically are priced 60-70% below the bookstore retail price. Used textbooks typically are priced 35% below the retail price of a new textbook. An incoming freshman studying Geology, Business, Math, English Literature and Psychology, can save almost 70% more money when renting. That same student saves 32% or just over 3% when purchasing used or new textbooks, respectively. An overriding majority of responders stated that price was a factor in their purchasing choices. When asked why they purchased textbooks online, 66% cited cheaper prices, 29% said convenience and 3% said better selections. Cheaper prices also factor into the equation when students buy from brick and mortar stores. Fifty-nine percent of respondents said that pricing is the most important issue when purchasing textbooks from a campus bookstore. "We also have news for anyone thinking that print books are heading the way of the dinosaur," said Montgomery. "College students flat-out prefer old school, hardcover textbooks to eTextbooks. Surprisingly, less than 8% of respondents prefer eTextbooks." Since 1999, eCampus.com is the online retailer of choice for cheap, new and used textbooks. eTextbooks were added in 2008; followed by rentals in 2009.
eCampus.com , the online book retailer that has saved customers more than $20 million in textbook rentals since 2009, recently introduced its eWards loyalty program. eWards is the ultimate loyalty program for buyers of college textbooks and merchandise. Just like everything on eCampus.com, earning and redeeming eWards for exclusive rewards and VIP benefits is easy, simple and fun. There are two ways to enroll, after a purchase, or via the customer's eCampus.com account. In fact, just signing up earns members 50 points. Once enrolled, members receive a 5% off deal that they can easily share via Facebook, Twitter, or email. If a friend completes a purchase through the shared link, referral points will be awarded to the original customer. The eCampus.com eWards program lets students use the power of their social network to save money on future textbook purchases. Members can come back to eCampus.com throughout the semester and continue to earn points by simply sharing deals and products to their social network. This way, members collect points throughout the semester that can be used toward next semester's textbook purchases. In addition to social media and email, members also earn eWards when buying, renting and selling books and other merchandise – and they can trade in their eWards points to earn rewards and discounts toward shipping and future purchases. Since 1999, eCampus.com has been the trusted source for cheap, new and used textbooks. eTextbooks were added in 2008 followed by textbook rentals in 2009. Since eWards was introduced, eCampus.com has seen an astounding percentage of customers joining the program after just their first order. There is no doubt that eWards will quickly become the most popular online textbook rewards currency. Join today at https://www.ecampus.com/ecampus-ewards. College students choose eCampus.com as the Best in the Business in the 2012 About.com College Life Readers Choice Awards. eCampus.com is proud to announce they are the winner of the 2012 About.com College Life Readers' Choice Award for the Best Website to Buy College Textbooks. After thousands of votes were submitted and strong competition from other major online textbook sellers, eCampus.com came out on top. "We are very thankful for our loyal customers who voted for eCampus.com to win the 2012 About.com College Life Readers' Choice Award. Whether students choose to buy from our large stock of new and used textbooks, rent their textbooks or get eTextbooks from our ever growing selection, we strive to provide college students with a great textbook experience from beginning to end. And it's that type of commitment to our customers that wins us an award like this one," stated Matthew Montgomery, President and CEO of eCampus.com. The About.com Readers' Choice Awards are given annually and chosen by the readers to recognize the best of the best. The Best Website for Buying College Textbooks award aims to help students figure out which online textbook seller is the "crème de la crème" for buying textbooks. Aligning with their goal to connect even further with college students, eCampus.com has launched their flagship brick and mortar bookstore at the University of Kentucky. Located at 395 South Limestone in the heart of campus, the eCampus.com University of Kentucky Bookstore aims to offer innovative services and unique products to set it apart from traditional campus stores. "Although we were the first company to offer textbook rentals at UK, we didn't want to stop pushing the envelope." explained eCampus.com President and CEO Matthew Montgomery, "We wanted to build a refuge for students to call home throughout the entire semester. Where other campus businesses shun student study groups and post anti-loitering signs, we built a comfortable study area with free Wi Fi where students can hang out all day if they choose. We even put in a pop-a-shot machine so students can play a few rounds in between classes." Students can earn a discount on their purchase depending on what score they achieve on the arcade basketball game. The flagship store also offers limited edition apparel, such as the We Want 8 t-shirt. They are even giving away fifty of these exclusive t-shirts at their Madness on Lime event on March 21st. Students can stop by and listen to live music from local student country artist Jordan English or participate in the store's pop-a-shot tournament and free giveaways. Harkening on their commitment to provide better services and products for students, eCampus.com introduced a new line of officially licensed NCAA college clothing just in time for the tournament. Offering a huge selection of apparel from over 400 schools, the company aims to provide traditional bookstore amenities with an ecommerce twist—free UPS shipping on all college clothing items. 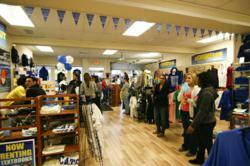 From jerseys and shorts to designer lines from Alyssa Milano, eCampus.com has a wider selection than any campus bookstore; allowing customers to shop from any NCAA school instead of being limited to items from their local team. eCampus.com wants to enhance students' NCAA tournament experience by giving away a 3D LCD HDTV and 20 other daily prizes in their Game Day Giveaway. The sweepstakes is hosted on the company's Facebook page and lasts until the National Championship Game on April 2nd. In the spirit of innovation, eCampus.com is the largest online college textbook retailer to offer college apparel on their site; increasing relevancy 365 days a year instead of the first couple weeks of the semester. With a physical presence at the state's largest university, the textbook retailer has their finger on the pulse of the college market. They will be able to use this knowledge to keep up with the latest campus trends and provide the most pioneering features to this prized demographic. The recent survey of college students by the online textbook retailer found that "lower price" was the main reason for purchasing an eTextbook (48 percent), while "instant access" (25 percent) and "portability" (19 percent) were also cited for reasons to purchase an eTextbook over a traditional one. "We did experience a marked increase in eTextbook sales in January, however eTextbook sales still only represent 3 percent of our total annual sales." said Matt Montgomery, President and CEO of eCampus.com. "Our research indicates that the lower price is what is really driving students to purchase eTextbooks, not the extra time saved using them. We find this very interesting because in the vast majority of cases renting and returning a textbook at the end of the semester still remains the most cost effective solution." Another perk of using eTextbooks cited by those surveyed is having access to myriad hi-tech features, such as the ability to take notes and highlight, or copy and paste text and print pages. Survey participants found the "search" feature to be the overall favorite (52 percent), followed by "highlighting" (20 percent) and "copy/paste" (14 percent). Beginning Cyber Monday, eCampus.com will provide a textbook example of money-saving economics: any apparel item from its new online store ships for free. The online textbook retailer began selling more than 40,000 items of college apparel earlier this month, and now the popular the site will ship any apparel order at no extra cost. This is in addition to the company's already successful free shipping program which offers no-cost shipping on orders over $59 and free return shipping for all textbook rentals. 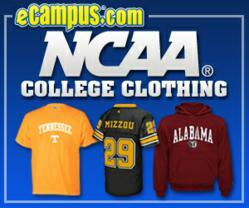 "We've already seen tremendous success with our newly offered college apparel. And starting Cyber Monday, we've structured it so that it becomes even more appealing to shoppers," said Matt Montgomery, CEO of eCampus.com. "And if you're looking to make a textbook transaction from our site that does not qualify for free shipping, you can simply add any piece of college apparel to reach a $59 total, and have the whole order shipped for free. It's a great way to entice shoppers to check out our selection and to experience the benefits of our site." Typically, any textbook order on eCampus.com must reach a total of $59 to receive free shipping. Now, students with a textbook order of less than that amount can simply add an apparel item to bring the total to the $59 threshold in order to receive free shipping. So for those ordering one or more books that don't add up to $59, it may make sense to add a Duke t-shirt or a Syracuse sweatshirt or U. of Florida gloves to the order to have the whole transaction shipped for free. In addition to announcing the start to its free shipping for apparel program, eCampus.com is also reducing the price on a number of popular bestselling books for Cyber Monday only. On average, eCampus.com is lowering the price of more than 20 current best-sellers by more than 35%. These books include: Steve Jobs ($20.99),Moneyball: The Art of Winning an Unfair Game ($9.49), The Help ($9.49), A Game of Thrones($5.99), Jack Kennedy: Elusive Hero ($16.49), and The Litigators ($17.49). These products as well as other various Cyber Monday deals provided by eCampus.com can be viewed on the eCampus.com Cyber Monday Deals page. Best known for its easy, fast, and cheap way for students to rent, buy, and sell textbooks, eCampus.com has added a new chapter to its offerings by introducing upscale collegiate apparel to its inventory, including licensed items for more than 430 different colleges and a recently-released line of women's apparel called "Touch by Alyssa Milano." Priding itself on its convenience and service, the site will act as a virtual full service bookstore for students, as well as for friends and family looking to rock a loved one's college gear proudly. Now when students click "add to cart" on their textbook order, they can throw in a new college sweatshirt for that week's tailgate as well. To kick-off fan excitement, eCampus will be hosting a weekly "Shore of Jerseys" giveaway on their Facebook page where lucky winners will receive a NCAA football jersey. The contest will launch on November 10 and run thru the first week of January for the BCS National Championship game. "We are very excited for the official launch of collegiate apparel on the site," said Matt Montgomery, CEO of eCampus.com. "We are constantly looking for ways to build eCampus.com as the preferred destination for today's student, and this move toward licensed collegiate apparel puts us firmly top-of-mind." The initial offerings will include more than 300 items for the University of Texas, over 470 items for the University of Alabama and over 600 items for the University of Michigan. A total of 431 major colleges and universities will be represented in all, spanning more than 67,000 diverse apparel items. "We anticipate our top sellers to be the University of Texas apparel considering that Texas students make up about 10% of our site traffic," Montgomery said. "We are happy to now provide long-time fans of our site with even more items they will love." eCampus.com will now carry popular brands such as Under Armour, Adidas, Comfy Feet, New Era, and more. Customers can easily shop by team name, gender, item type, or event category. Some of the larger inventory items include: jerseys - 606 of them at prices ranging from $21.99 to $199.99 for authentic game jerseys; sweatshirts - over 6,700 of them available for 395 teams ranging in price from $20.00 to $90.00; and t-shirts - over 7,700 available at prices ranging from $5.99 for a single shirt to $39.99 for multipacks. The "Touch by Alyssa Milano" line was specifically designed to make it easier for women to look stylish while cheering on their favorite teams. eCampus will be offering items such as long-sleeve shirts, pants, t-shirts, sweaters and sweatshirts under this women-only line, and, more specifically, it will include the fan-favorite NCAA logo denim. If there is a cheaper way to do something, cash-strapped college students will find a way to do it. And with the most recent textbook sales period now in the books, it's clear that today's co-eds have taken "new" textbooks off their list, opting to rent rather than buy. According to eCampus.com, one of the pioneers of online textbook retailing, nearly one in five of all college textbook purchases online today is a rental. Two years ago, online textbook rentals accounted for just 1 percent of all sales. Retail textbook sales represent an $11 billion annual industry, with approximately 25 percent of all sales conducted online. When textbook rental started to become a viable option for students to obtain their course materials, eCampus.com found itself uniquely positioned to add textbook rental to their product offering as well as begin to supply most of the other online rental companies with textbooks to fulfill their orders. The decision has yielded incredible growth. As more students turn to rentals, the purchase of new textbooks is plummeting. Sales of new textbooks have dropped from 71 percent of all purchases four years ago to slightly more than 40 percent today, according to eCampus.com. The purchase of used textbooks has grown steady over the past three years, from 29 percent of all sales in 2009 to more than two-thirds (37 percent) today. "The rise in textbook rentals has been phenomenal these past three years, mainly because students see the economic advantage to renting something that they will only use for less than four months," said Matt Montgomery, CEO of eCampus.com. "Textbooks remain a major expense for college students, and that's why they're excited about a concept that provides the exact same product, but at a substantial cost savings." eCampus.com estimates that textbook rentals typically are priced at 60-70 percent off of the bookstore retail price. Used textbooks typically are priced at 35 percent off the retail price of a new textbook. "We're also finding that textbook rentals appeal to students because it alleviates the hassle of getting stuck with a textbook that has a new edition, and there is great flexibility with rentals in terms of extending the rental period, or even opting to purchase the book if they decide to," said Montgomery. "Online retailers have a big advantage over bookstores when it comes to renting, as most local players don't have the inventory or geographical reach to make it profitable to offer textbook rentals." "Renting online is the ideal set up for today's college students. It's easier, faster, cheaper and it's delivered straight to their door. Purchasing textbooks is not something that every college kid enjoys doing, but there are ways to make it a lot less painful, and much more attractive," said Montgomery. Online Textbook Retailer to Create Infographics Displaying Life as Students Know It: Card Catalogs and Pan American Airways Draw A Blank, While GPS Navigation Systems and Cartoon Network Strike A Chord. From technological advancements to changes in popular culture, the popular Beloit College "Mindset List" seeks to help college professors understand how different their students' lives are from their own by examining cultural touchstones. And thanks to a collaboration with the online textbook retailer, eCampus.com, the generation gap will continue to be bridged as the two organizations work together to create infographics to further support the List's findings. eCampus.com, which currently creates a series of infographics on its website touching on topics relevant to college students, will adapt the recent findings from the "Mindset List" to show in visual form the cultural touchstones of students of the graduating classes of 2011 through 2015. The "Mindset List" was first published in 1998 and has since evolved into a well-known blog, an annual list, and a book. Created by Ron Nief, alongside fellow Beloit College Professor Tom McBride, this innovative index of insights explores cultural benchmarks involving each year's college freshman class. It was created to reflect the world view of entering first-year students when the authors first realized how much the 2002 class of college freshmen were shaped by the history and culture they had not experienced in their first 18 years. The list has also helped professors understand where their students "were coming from" by providing insights into the technology and references with which they grew up, and the zeitgeist that helped shape and form who they are. Utilizing the most recent findings from the "Mindset List," eCampus.com designer Elizabeth Lovejoy has created a series of infographics that illustrate the culture of today's college student. The eCampus.com "Mindset List" visuals will be featured in the eCampus.com library of college infographics, along with the online textbook retailer's other highly popular illustrations depicting such relevant topics as the cost of school, the impact of student debt, and alcohol use on campus, to name a few. "We find infographics are great communication tools when it comes to college culture," said Matt Montgomery, president and CEO of eCampus.com. "They are designed to resonate with both college professors and students alike, allowing both generations to understand the history and culture that surrounds them and in turn, better understand and communicate with each other." In addition to publishing the infographics, eCampus.com is now selling and renting a new book co-authored by Mr. Nief and Mr. McBride entitled The Mindset Lists of American History (John Wiley & Sons, Inc publishing, Copyright 2011). This new book takes the "Mindset List" approach and applies it to the past ten generations, giving insight into their respective culture and lives. The "Mindset List" has received praise from NBC Nightly News and The Seattle Times. Additionally, it has received news coverage by CBS news, Boston Globe, Chicago Tribune, USA Today, and Fox News as well as various international publications. In 2009, TIME magazine declared the mindset list was a new phrase in the American Lexicon. It is released every year in mid-August via webcast and press release. Getting back into the swing of college will be a lot easier for 30 college students this year. eCampus.com is launching the "EZ Living Sweepstakes" that will give away a desirable dorm room essential each day for 30 days. Beginning August 15th eCampus.com will be offering a daily giveaway of such items as an Apple iPad 2, an HDTV, Playstation 3, Xbox 360 Kinect and Apple TV. Thirty lucky winners will be awarded one of 30 different prizes each day throughout the back-to-school season. And the prizes become increasingly more valuable throughout the course of the 30-day sweepstakes. The "EZ Living Sweepstakes", will begin accepting entries August 9, and up until its conclusion September 13. Entering the contest simply requires submitting a name and email address. Every entry remains in the drawing for the entire 30 days. "After spending a relaxing summer off, we realize it's hard for students to go back to campus with a positive frame of mind. So, we're doing our part to help make that transition as effortless as possible," said Matt Montgomery, CEO of eCampus.com. "College students represent the lifeblood of our business, and the ‘EZ Living Sweepstakes' is a great way to further cement this connection we have with them." eCampus.com has gathered a must-have list of back-to-college essentials that range from the utilitarian (Ipod docking alarm clock radio) to the ultimate (iPad 2). One winner will be drawn at random each day to receive that day's unique prize. Students are encouraged to re-enter the "EZ Living Sweepstakes" every day to have additional opportunities to win. Sharing news of the sweepstakes with friends will also pay off, as this will net you an additional prize entry. eCampus.com anticipates that the sweepstakes will increase the already robust constituency of its social media campaigns, and increase its brand awareness as the one-stop shop for all textbook needs. eCampus.com, a leading online textbook retailer, has been fundraising towards several clean water projects in Northern Ethiopia through the non-profit organization charity: water. eCampus.com, a leading online textbook retailer, has been fundraising towards several clean water projects in Northern Ethiopia through the non-profit organization charity: water. They are pleased to announce that they have generated the funds to provide an entire village with a clean, safe water supply. The community of Maikremto, population of over 300 people, will have a water source and several local villagers trained to manage it, when the project is complete in March 2012. According to charity: water, almost one billion people on our planet do not have access to clean, safe drinking water causing 80% of diseases worldwide. eCampus.com is proud to help them make a difference. Corporate social responsibility is becoming increasingly important as technology closes the gap between our world and that of the less fortunate. 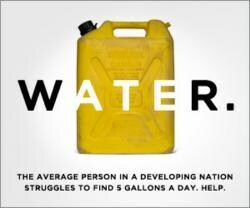 Meeting people's needs through organizations like charity: water shows the compassion the company has for people in underdeveloped nations. eCampus.com considered funding the clean water initiative in 2010 and has implemented several marketing campaigns aimed at generating awareness of the fundraiser. The "eCampus Entourage", the company's student brand ambassador program, has been a large source of financing for the website's contributions over the last year and they will continue to pull from the program to aid the organization. Furthermore, eCampus.com has made a commitment to fund an additional three water projects over the course of the coming year, with the potential total impact of providing access to clean, safe drinking water for more than 1,000 people in need. eCampus.com would like to thank charity: water and everyone else involved, especially their customers, for making this accomplishment possible. "Our overall objective has always been to provide our customers with a strong value," said Matthew Montgomery, CEO of ecampus.com. "The ability to enhance that value by funding this initiative is something that we are proud to be a part of." eCampus.com announced today the winner of their Excellence Awards scholarship, a competition to find the most well-rounded, outstanding college student in America. Chris Fernandez, an electrical engineering student at Binghamton University in New York is the recipient of the Excellence Awards $2,000 scholarship. Fernandez, a freshman at the university, beat out over 400 other applicants and received nearly 500 votes on the company's Facebook voting application. The company began the search for the most excellent student in America on April 1st and continued through April 22nd. In that time period eCampus.com received over 400 applications from outstanding students all across the country. They then narrowed the applicants down to the Top 5. From there, the public was invited to vote for their favorite candidate on the company's Facebook page. The voting period ended Monday, and Fernandez was announced as the winner. Fernandez was joined in the Top 5 by Angel Cadena Jr., a student at Southern Connecticut State University; Ashley Carr, a student at Indiana University Bloomington; Alexis Smith, a student at Lee University, and Lauren Delpont, a student at Transylvania University. The candidates received a combined total of 1,392 votes on the company's Facebook page, and Fernandez won with 491 of those. The criteria for the Excellence Awards stated that the student possess outstanding work ethic both in and out of the classroom, academic excellence, community leadership, and involvement in school activities. Some of Chris' achievements include: completing the rank of Eagle Scout through the Boy Scouts of America (serving as the Senior Patrol Leader of his troop for a year); planning, organizing and leading a landscaping project and flowerbed installation at a new elementary school playground in his community; four time High School All-American in track; maintaining a 3.5 GPA in his first semester as an electrical engineering student; and running a freshman school record for the 800-meter distance in track at Binghamton University. Chris Fernandez Is the recipient of the eCampus.com Excellence Award. Chris had this to say about his receiving the award, "This scholarship will help me to continue the excellent education I am gaining at Binghampton University, and I know that the support I am receiving will help me to reach my goals. Thank you eCampus for making education more affordable for me and for all students." Thanks to the success of the campaign, the company plans to make the Excellence Awards an annual occurrence. "Giving back to students is what we're all about. Chris is a perfect example of a hardworking student and we are happy to reward him for all his achievements," said Matt Montgomery, eCampus.com's CEO. The four runners-up all received a $250 gift card to eCampus.com for the purchase of textbooks or merchandise on the company's website. Fernandez won a $2,000 scholarship from the company, and all students at Binghamton University will receive 30% extra buyback credit with an active Binghamton University email address and a coupon code posted on the companies facebook page when selling textbooks back to eCampus.com through 2011.
eCampus.com Releases Mobile Website in Preparation for "Textbook Buyback" Season. eCampus.com, an Internet Retailer top 250 eCommerce site unveils a new, user-friendly, mobile version of their website today. eCampus.com, a top online textbook retailer, unveiled a new, user-friendly mobile version of their successful online website today. The new mobile platform focuses on customer experience and usability when purchasing, renting, or selling textbooks through eCampus.com. The release of the mobile site comes just in time for the company's textbook buyback season. Students flock to eCampus.com every semester to sell their used textbooks and receive cash or in-store credit for their buyback purchases. The launch of the new mobile site will assist with the massive influx of traffic and help mobile users get through the selling process more quickly and efficiently. "The decision to launch an optimized mobile website was largely driven by our focus on giving students the best possible experience when renting, buying, or selling their textbooks," said Matt Montgomery, President and CEO of eCampus.com. The mobile website, which is designed to simplify the buying and selling process, is compatible with most popular mobile phones, platforms and devices, including Android, Blackberry, iPhone, iPad and iPod Touch. According to Montgomery, the goal was to keep the user experience limited to sixty seconds or less to maximize conversion on all applicable devices. "With the increase in mobile device usage, it made sense to streamline the process for our users electing to sell or shop for textbooks using their phones. Our commitment to our customers is to be the best source for a student's textbook needs. This means offering the most accessible, most secure, and most seamless process possible," Montgomery said. By entering the title, author or ISBN of specific textbooks, students are able to instantly access price quotes on the new mobile version of the site, as well as purchase and rent them. Customers who visit eCampus.com through mobile devices will be automatically redirected to the new userfriendly mobile version of the site, which can also be accessed by heading to m.eCampus.com on any internet browser. "As college students continue to rely heavily on their mobile technology, eCampus.com will continue to make their textbook experience as easy and user-friendly as possible," Montgomery said, solidifying the fact that eCampus.com continues to implement new enhancements and technologies as they develop. eCampus.com, a top online textbook retailer, announced this week their plans for a 2011 eCampus.com Excellence Award to reward an outstanding college student for his/her achievements both inside and outside the classroom. The search has begun to find the most well-rounded, driven, and just plain "awesome" students in America. eCampus.com is searching for recipients based on academic excellence, work experience, involvement in school activities, impact on society and community leadership. Applicants are required to fill out an online application form, including a short biography about themselves and why they feel they should win the eCampus.com Excellence Award. Applicants will also be asked to answer a short essay question regarding the future of e-commerce. Interested students are also encouraged to make a YouTube video convincing the company that he/she is the perfect recipient of the award to supplement their application. The company, who reached record success with its textbook rental program in January, wanted a way to give back to the students it serves. "We wanted to come up with a way to reward students for all their hard work at the end of the school year," said Matt Montgomery, President and CEO of eCampus.com. "This award is designed to acknowledge those successful, hardworking young students out there who exhibit strong leadership and give back to their communities. I am anxious to see all of the excellent students we will discover as a result of this award." The company will begin accepting applications on its website March 31st and continue through Friday April 22nd at midnight. From there, the company will narrow down the top 5 applicants across the country and host online voting from April 25th to May 9th on eCampus.com to determine the winner. The student with the most votes at the end will be the recipient of the 2011 eCampus.com Excellence Award and receive the grand prize, a $2,000 scholarship, as well as placement on the company's website. The four runners-up will receive $250 eCampus.com gift certificates for the purchase of future textbooks or gifts on the company's website. Along with the grand prize, the winning student's university will also receive 30% extra buyback credit for all students with an active email address for that university when selling textbooks back to eCampus.com through 2011. Online textbook retailer sets record for textbook rentals in the month of January, saving students even more money. eCampus.com, a top online textbook retailer, reached a new company record in the first month of 2011 with its textbook rental program. Spring rush was a huge success for the company and exceeded all goals for the month. The company shipped out just under 200,000 textbooks in January alone, a 400% growth year over year for textbook rentals. The company, based in Lexington, Kentucky, began offering the option to rent textbooks in August 2009. Since then, the rentals have proven to be more cost-efficient for students, saving them even more money than buying new or used textbooks. Students have the option of renting textbooks in three different time frames: semester, quarter (90 days), or short term (60 days), for varying prices. January was a big month for the company all around. eCampus.com had record sales with eTextbooks as well, an industry that continues to grow year over year for the company. The textbook retailer also achieved record sales for the eCampus.com Entourage, a student brand ambassador program designed to reward students for spreading the news about eCampus.com's superior selection, prices and service. The program earned the company almost as much revenue in the month of January as it did for the entire year of 2010.
eCampus.com is the go-to website for cheap college textbooks. eCampus.com offers five different buying options for acquiring textbooks on their site. The site offers the purchase of new and used textbooks, textbook rentals, downloadable ebooks, and a marketplace function where customers can purchase used textbooks directly from other students. The site also offers a large inventory of DVDs and Blu-rays, as well as licensed college clothing and gifts. Student Brand Ambassador program, eCampus.com Entourage, achieved record sales in January 2011; as a result, students across the country will receive healthy commissions for spreading the word to their peers about eCampus.com. Student Brand Ambassador program, the eCampus.com Entourage, achieved record sales in January 2011; as a result, students across the country will receive healthy commissions for spreading the word to their peers about eCampus.com. During January 2011, the eCampus.com Entourage program garnered the company almost as much revenue as the program did for the entire year of 2010. The program yielded thousands of orders in January, including textbook rentals, ebook purchases, used/new textbook purchases and merchandise orders, sending out record commission's to members of the eCampus Entourage program. The Entourage program, which the company rolled out in May of 2010, is a marketing brand ambassador program designed to reward students for spreading the good news about eCampus.com's superior selection, prices and service. Members earn commissions based on orders used with their unique discount code. Students must apply to be a student brand ambassador for the Entourage program on the company's website. Upon acceptance, students are given a unique code. The discount code is valid for 5% off everything at eCampus.com. When the code is used, the Entourage member receives $5 for every textbook rental; $3 for every used textbook purchase; $2 for every eBook purchase; and $1 for every new textbook purchase. Students have the opportunity to cash in big time with the Entourage program by spreading the word about eCampus.com to all of their peers. The company's Entourage program has proven to be a great way to assist students in paying for college by giving money back to them. Online textbook etailer eCampus.com recently compiled research from various sources into a detailed infographic explaining the cost of tuition at various types of schools and the debt this causes some students to carry after graduation and into their professional careers. According to the infographic posted on the eCampus.com Blog, tuition is rising at an average rate of 5.5% every year. Students at a public 2 year institution should expect to get the cheapest education, paying on average $2,713 for 1 year of classes. Private 4 year colleges come with the highest price tag, averaging around $37,000. This totals the cost of a 4 year education at a private college to be approximately $148,000. At such high costs students are racking up student loan debt like never before. Over two thirds of all graduating students have some type of student loan debt. The average student loan debt is now $23,186 per student. On a repayment plan at $175 each month, students can expect to pay off this amount in 33 years, paying over $45,000 in interest along the way. This leads over 7% of all student loan debtors to default within the first year of repayment. "These figures could make your head spin. By publishing statistics like this in an easily digestible manner we would hope that we can help educate our customers to make good financial decisions", said Matt Montgomery, President and CEO of eCampus.com. "At eCampus.com we strive to provide great deals for our students so that college isn't so difficult on their future finances. In addition to our already great deals we are now renting textbooks and saving students more money than ever before." The infographic also details the difference in earnings a college student might experience depending on their degree and major choice. According to the infographic, engineering students stand to make the most money during their careers, with petroleum engineers making the most at $157,000 per year. On average, students who graduate with a bachelors degree will make half a million dollars more per year than people with just a high school diploma, but still $1.3 million less than someone with a doctoral degree. 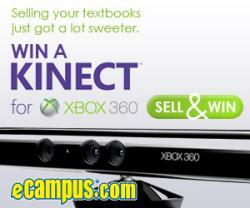 To celebrate their growing online textbook rental market, eCampus.com, America's full-service textbook superstore, is giving away one Xbox Kinect to college students selling their textbooks or by joining the eCampus.com Facebook Fanpage. To celebrate their growing online textbook rentalmarket, eCampus.com, America's full-service textbook superstore, is giving away one Xbox Kinect to college students selling their textbooks or by joining the eCampus.com Facebook Fanpage. As the leading textbook company for college students, eCampus.com is offering a unique promotion with an Xbox Kinect. Every student selling a used textbook to eCampus.com during December will be entered to win; one entry per book. Students can also become Facebook fans of eCampus.com to receive an additional entry into the contest. "The Xbox Kinect is a way to show students that we appreciate their business," said Matt Montgomery, President and CEO of eCampus.com. eCampus.com provides students with excellent service as they buy a broader range of textbook titles across all campuses nationwide. College students will receive more money when selling books to eCampus.com because eCampus.com buys more books and textbooks than anyone else. eCampus.com offers three methods of payment: check, direct deposit or in-store credit. "We are the best option for college students to get top dollar for their used textbooks and we buy back more titles than anyone else," said Montgomery. "Our newest opportunity is through book rentals, a way to save our customers even more money. We understand our market and want to provide college students with the most economical way to buy and sell used textbooks." Textbook rental allows students to cut costs significantly every semester. Instead of purchasing multiple books every semester, students can rent textbooks and send them back when the semester ends. It's easy, fast and cheap. Leading online textbook retailer, eCampus.com, was curious as to what its student customers would want as a gift for the holiday season. eCampus.com asked its customers one question, "What would you buy yourself if you had an extra $40?" Students responded in various ways. Even though the question was set up to get the students to choose an item they would buy for themselves, many students said that they would donate an extra $40 if they had it. Sonja Smith-Gamble, a graduate student at Lindsay Wilson College, said this "I would use an extra $40 by donating it to feed the children of America or to a toy drive so children in America will have a new toy for Christmas". Several other students said that they would use and extra forty dollars to go home and spend the holidays with their family. Some students however did specify gifts they would buy for themselves if they had the chance. Johanel Reyes of Montclair State University of New Jersey had this to say "Favorite gift under $40 would be a cool new case for my phone". eCampus.com chose three different winners from the survey to receive what gift they desired. Bobby Nathan from Amberton University was awarded $40 in eCampus.com store credit, Brianna Leonti from Rhode Island College was awarded a $40 gas card and David Going from West Virginia University was awarded a compilation of Eric Clapton songs. "We love having these types of contests because not only do we gain insight into the wants and needs of our customers, but we get to provide a lucky student with a huge discount on our already cheap textbooks", said eCampus.com president and CEO Matt Montgomery. Students can sell textbooks to eCampus.com through their Textbook Buyback Program and get on average, $40 for each textbook sold. eCampus.com also offers an extra 20% extra when store credit is chosen as the payment option. Students can then use the store credit to rent textbooks the following semester and save even more money. Online textbook retailer, eCampus.com, announced their Cyber Monday promotions including free shipping on all orders including books, textbooks, DVDs and college clothing. The promotion begins at midnight EST on Monday, November 29th and concludes at the end of the day. In addition to free shipping, eCampus.com will also be offering savings of up to 75% on textbooks with a variety of coupon codes. Cyber Monday coupons inspired by the MTV series Jersey Shore provide college students the ability to earn more money when selling their textbooks back to eCampus.com. Coupon codes "SITUATION", "SNOOKI" and "JWOWW" will provide students with up to 20% more in cash when selling textbooks back to eCampus.com. "With the rising cost of textbooks, students struggle to pay for required course materials and every day expenses. We want our students to get the most for their money with exclusive promotions and free shipping on the biggest online shopping day of the year," said Matt Montgomery, President and CEO of eCampus.com. eCampus.com, a leading internet textbook retailer, recently asked students to participate in a survey to help them better understand what their customers do with savings from renting textbooks. Students were asked one simple question; What did you do with the money you saved by renting textbook this semester? eCampus.com, a leading internet textbook retailer, recently asked students to participate in a survey to help them better understand what their customers do with savings from renting textbooks. Students were asked one simple question; What did you do with the money you saved by renting textbook this semester? The results of the poll are here. eCampus.com began renting textbooks in August of 2009, and is now an industry leader. Their rent and return program works a lot like renting anything else. A student would choose the duration for which they need the textbook, they then pay a percentage of the list price of the book as a rental fee. eCampus.com ships the book and the student uses it for the allotted time period. After the rental term expires the student can print a shipping label allowing them ship the book back for free. Overall eCampus.com saved students over 2.4 million dollars by renting textbooks versus buying them. Customers responses covered all different types of spending. From diapers to various bills, to a new kitten, all of the customers seemed to have a use for some spare cash. "It makes us feel great to see that we can help students cover their expenses easier by using our textbook rental program." said Matt Montgomery, eCampus.com President and CEO. Some students had this to say: "I used the money to get new badges and awards I needed for my Army Service Uniform Some students had this to say: "I used the money to get new badges and awards I needed for my Army Service Uniform", said Jim Beebe. One student, Angela Cluley said, "I used the extra money I saved to help pay for my Alternative Winter Break trip where I can volunteer a week of my time to help others in need during my winter break" "eCampus.com saved me so much by renting me my textbooks! I saved enough money to buy 3 new DVDs!" Sarah N., Freshman at UCLA." Textbook giant eCampus.com recently concluded a research study compiling statistics geared at helping current and prospective college students prepare for the experience and opportunity higher education provides. Textbook giant eCampus.com recently concluded a research study compiling statistics geared at helping current and prospective college students prepare for the experience and opportunity higher education provides. The findings of this research study have been incorporated into the development of an infographic which contains information regarding enrollment statistics, various costs associated with the college experience, and the use of social media by students as well as other useful visual data. According to the infographic posted on the eCampus.com blog, college students tend to put on weight during their freshman year. Male college students gain an average of 5.5 pounds while female college students gain an average of 4.5 pounds. This is partially due to the fact that 4 out of 5 college students drink, with over half of those students binge drinking. Another interesting statistic to consider as a prospective college student, is that 1 in 10 college admittance councilors admit to checking student Facebook profiles and 38% of those councilors found content that was less than flattering to the student applying. The infographic also shows that the cost of a college education is not cheap. Students who are attending an in-state public 4-year college on average will pay $7,020 per year, while those seeking a degree from a private 4-year college should expect to spend on average $26,273 per year. Students at Sarah Lawrence College, the most expensive college in the country, will pay over $220,000 total for their 4 year degree. There are about 4.5 million college students, but 30% of students will spend thousands of dollars but will not graduate. On top of tuition, students are required to have the necessary course materials. The average amount students spend on textbooks each year is about $1,122. Two out of three students graduating with a bachelor's degree have student loan debt, and 17% of them will graduate with over $30,500 in debt. Some expenses are inevitable but eCampus.com is a great resource for saving money. One way for students to save money is by renting textbooks. This fall, eCampus.com helped save students a total of 2.4 million dollars by renting their textbooks. Students pay a smaller fee to rent textbooks, and at the end of the rental term can return their textbooks hassle free. No time or money wasted. Scholarships are another great way to get out of college debt-free. In the 2008 school year, $126 billion in scholarship money was awarded to students, some need based and some not. 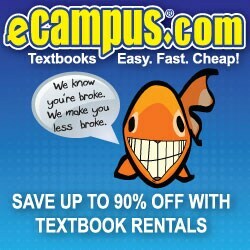 Students on college campuses all over the country are saving more money with eCampus.com's textbook rental option. Renting is rapidly growing in popularity because of the substantial savings as well as the ease of the purchase and return process. Students on college campuses all over the country are saving more money with textbook giant eCampus.com's textbook rental option. Renting is rapidly growing in popularity as a result of the substantial savings and the ease of the return process. eCampus.com allows students to rent their textbooks along with being able to buy used, new, or ebook textbooks. In accordance with their stated mission, eCampus.com's rental process has been designed to be easy, fast, and cheap. The process is hassle free and the return shipping is free as well. Students, like Hannah F. at Utah Valley University, like that she is able to return the textbook and not have to keep it on her shelf. "eCampus.com textbook rentals are great! I got all my books within a week of ordering them, all in good condition, and it cost me a fraction of what buying a book would cost! Plus, I don't have to deal with the hassle of trying to sell the books back at the end of the year!" This Back to School season, eCampus.com has saved students over $2.4 million in textbook costs. On average, students who rented from eCampus.com saved 65% of retail price on their course materials. Renting textbooks has become eCampus.com's most popular purchase option and students all over the country are enjoying the extra cash they would have spent on textbooks. Now students can afford that new iPad, or even buy gas for another trip home for the weekend. "eCampus.com textbook rentals saved my life, and about $200, now I can afford to buy groceries!" said Gabe D., a Senior at Duke University. "Thanks eCampus.com for your amazing textbook rental service, you saved me time and money, and I don't even have to deal with the bookstore here on campus." said Kevin S., Junior at Arcadia University. eCampus.com is proud to announce the implementation of a new tiered rewards system making the eCampus Entourage the most lucrative student textbook rewards program in the country. eCampus.com is proud to announce the implementation of a new tiered rewards system making the eCampus Entourage the most lucrative student textbook rewards program in the country. While other companies are scaling back their commission structures, eCampus.com is actually increasing rewards for members. Anyone with an Entourage code will still receive 5% off their eCampus.com orders for as long as they are in school and receive $5 whenever friends rent textbooks, but as of September 1st, students will also receive $3 for used textbooks, $2 for eTextbooks and $1 for new textbook purchases. "The eCampus.com Entourage is moving forward in support of our customers at a time when other programs are scaling back," said eCampus.com CEO Matt Montgomery. "We are not afraid to support the loyalty of our customers monetarily through the Entourage program or by offering the lowest prices on textbook rentals and purchases every day." Launched in June as a textbook rental rewards group, the eCampus Entourage has enjoyed explosive growth. Students from all corners of the country have signed up to start their own Entourages, making hundreds of dollars in the process. Here's how the eCampus Entourage works – Students sign up for a free account and are given a unique code to use for purchases at eCampus.com. Each code is good for a 5% discount on all purchases as well as a $5 bonus when selling books back to eCampus.com. Ambassadors are encouraged to build their own Entourage by sharing their unique code with friends who will then receive the same benefits when placing orders. Each time a friend uses an Entourage code to rent, purchase new or used textbooks or download eTextbooks, that Entourage member will receive $5, $3, $2 or $1 respectively, depending on the item purchased, with a maximum reward of $5 per order. In order to ensure that the ambassadors have every opportunity to be successful, eCampus.com provides continual marketing support and direction to students hoping to grow their entourage. The eCampus.com Entourage web site has been built to include a myriad of social media sharing tools designed to help ambassadors market their codes through Facebook posts, Twitter, blogs, email, text messaging and video. They will also have the ability to print flyers with their custom ambassador code that can be distributed at campus hot spots. Montgomery continues, "We are in the business of understanding the collegiate market and we know that the one thing they need more than anything is a little extra cash to get them through the semester. Everybody wins with the eCampus Entourage." 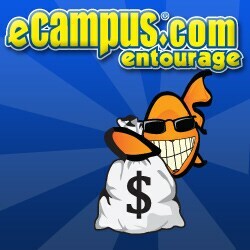 eCampus.com is proud to introduce the eCampus.com Entourage, a brand ambassador program aimed at providing cash rewards to students for doing what they do anyway – renting, buying and selling textbooks. Students sign up for a free account and are given a unique code to use at eCampus.com. Each code is good for a 5% discount on all purchases and rentals as well as a $5 bonus when selling books back to eCampus.com. Ambassadors are encouraged to build their own entourage by sharing their unique code with friends who will then receive the same benefits when placing orders. For every rental order placed with their code, the ambassador will receive a $5 referral bonus. The larger an ambassador's entourage, the greater the earning potential. "The eCampus.com Entourage will allow us to harness the energy and enthusiasm of our ambassadors to promote the savings offered through eCampus.com," said eCampus.com CEO Matt Montgomery. "We look forward to sharing the power of our brand with students nationwide." In order to ensure that the ambassadors have every opportunity to be successful, eCampus.com will provide continual marketing support and direction to students hoping to grow their entourage. The eCampus.com Entourage web site has been built to include a myriad of social media sharing tools designed to help ambassadors market their codes through Facebook posts, Twitter, blogs, email, text messaging and video. They will also have the ability to print flyers with their custom ambassador code that can be distributed at campus hot spots. Montgomery continues, "We know our customers are always looking for easier, faster and cheaper options for their textbooks. Now, by joining the eCampus.com Entourage, students can earn cash and other rewards on top of the savings already offered at eCampus.com And by providing students innovative social sharing tools on eCampusEntourage.com, we make it even easier for them to grow their own entourage." In addition to creating an easy revenue stream for ambassadors, students may also be able to receive college credit by participating in the program. The eCampus.com Entourage has been structured in such a way that students will receive valuable marketing experience that is both measurable and educational. eCampus.com is the only textbook provider offering new and used textbooks for purchase as well as textbook rentals and downloadable eTextbooks. Entourage coupon codes will be good for all textbook purchase options as well as on a large selection of DVD and Blu-ray titles as well as college clothing. eCampus.com, a leading Internet textbook retailer, has catapulted its textbook rental program into a major revenue contributor. Because of an expanded rental list and high customer satisfaction for the textbook rental program, more college students are turning to eCampus.com for their textbook rental needs. eCampus.com, a leading Internet textbook retailer, has catapulted its textbook rental program into a major revenue contributor. Because of an expanded rental list and high customer satisfaction for the textbook rental program, more college students are turning to eCampus.com for their textbook rental needs. "We are very pleased with the feedback we have received from our textbook rental program. College student interest in textbook rentals has exceeded our expectations. We remain excited to be able to offer college students the latest low price option for textbooks", says Matt Montgomery, President and CEO of eCampus.com. Renting textbooks saves students up to 90%, and the eCampus.com rental process has been designed to be simple and easy to use. Students can simply search for the textbook they need for class and rent it. At the end of the semester, students return the book at no cost. eCampus.com even pays for the return shipping. Textbook rentals aren't the only college textbook thing exciting Mr. Montgomery. eCampus.com is also showing significant growth in etextbook sales. Plus, with more used textbooks in stock and ready to ship than ever before, eCampus.com is well positioned to continue to offer America's college students more low-priced textbook alternatives than any other online textbook store. "Most students buy some and rent some as a practical matter. eCampus.com makes it easy for a student to get all of their textbooks in one place. Our company has been designed to accommodate student buying behavior "Most students buy some and rent some as a practical matter. eCampus.com makes it easy for a student to get all of their textbooks in one place. Our company has been designed to accommodate student buying behavior," continues Mr. Montgomery. "At eCampus.com students can rent, buy new, buy used, buy electronic or buy and sell off our student marketplace." The focus at eCampus.com is a wide variety of textbook purchasing options. Renting has become a viable option for college students, but it's not necessarily practical for a student to rent all of their textbooks. eCampus.com has conducted several focus groups and found that 6 out of 10 students prefer to keep some of their textbooks for future use, but not all. This is a big reason eCampus.com has received so much acclaim online for their "Rent 'em or Buy 'em" campaign. It is apparent that whatever new innovations surface in the years to come; eCampus.com will be there to make sure students get the best value for their textbook dollars. eCampus.com, a leading internet textbook retailer, launches a "Student Sweepstakes" giving away daily prizes to customers and students this fall to customers renting or buying textbooks online. 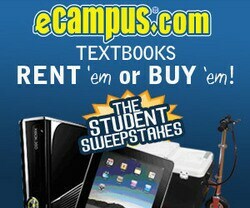 As the leading textbook online company for college students, eCampus.com is offering a unique sweepstakes, giving away a 16GB Apple Ipad, Microsoft Xbox 360 Kinect, an eCampus.com branded Motorized Cooler Scooter and other gifts with daily drawings. Every student who buys or rents a new/used textbook or etextbook for this fall semester will be entered to win. "We are always trying to show our appreciation to our customers," said Matt Montgomery, President and CEO of eCampus.com. "We want students to know that we are trying to keep them from being broke. With the costs of textbooks rising, we are the best option for college students to get their textbooks easy, fast and cheap." eCampus.com provides students with excellent service for a broad range of college campuses nationwide. eCampus.com offers college and high school students the ability to rent textbooks, buy used or new textbooks, etextbooks and a student marketplace. Students save more money with eCampus.com because eCampus.com offers more textbooks and textbook buying options than anyone else. In addition, textbook rental allows students to cut costs significantly every semester. Instead of purchasing multiple books, students can rent textbooks and send them back with free shipping when the semester ends. It's easy, fast and cheap. eCampus.com, a leading internet textbook retailer, is taking initiative to solidify its position as a compassionate corporate citizen by announcing full sponsorship of four clean water projects in Northern Ethiopia over the next 12 months. eCampus.com, a leading internet textbook retailer, is taking initiative to solidify its position as a compassionate corporate citizen by announcing full sponsorship of four clean water projects in Northern Ethiopia over the next 12 months. Nearly one billion people on the planet don't have access to clean, safe drinking water, a startling fact that too often goes unnoticed in the western world. eCampus.com will provide funding for the projects which will be planned and executed through New York City based non-profit organization charity: water. The concept and eventual implementation of the clean water initiative has risen from the June introduction of eCampus.com's student textbook loyalty program, the eCampus Entourage. Adrian Grenier, star of the hit television show Entourage, is a fan and follower of charity: water's work and mission and it is this connection that lead eCampus to charity: water's doorstep. As fall approaches, the eCampus Entourage will be used to support the clean water projects planned for the people of Ethiopia. charity: water will use funding from eCampus.com to implement freshwater projects and integrate hygiene and sanitation into the communities served. Montgomery continues, "We're obviously in the business of renting and selling textbooks, but our commitment to charity: water allows our customers to play a part in the rehabilitation and reconstruction of communities where help is needed most. Some people save whales, some companies save trees – we feel it's important to help save lives." eCampus.com announces Stephen Graber of Drexel University, Whitney Mitchell of Utah State and Jessica Hall of North Florida Community College as the three winners of their spring iPad giveaway. Textbook giant, eCampus.com, showed its gratitude to its loyal customers by giving away three 16GB iPads following the spring semester. To be eligible for the giveaway, a student sold their used textbooks to eCampus.com or became a member of the eCampus.com Facebook Fanpage between April 15th and May 30th. The winners were chosen randomly. eCampus.com, America's full-service textbook superstore is proud to congratulate Stephen Graber of Drexel University, Whitney Mitchell of Utah State and Jessica Hall of North Florida Community College. 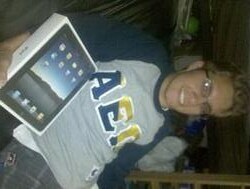 Each student was given a 16GB iPad along with other eCampus.com merchandise. "I really like the iPad, " said Jessica "The iPad is much more convenient than a computer. It should really help lighten the load in my backpack too." "Giving away iPad's to three students is a way for eCampus.com to show our customers that we appreciate their business," said Matt Montgomery, President and CEO of eCampus.com. "With their new iPads, these lucky students will be able to save even more money by getting their textbooks from our extensive selection of eTextbooks." "Thanks so much for my new iPad," said Steven. "All of my friends are super jealous. I can watch videos, share pictures, listen to music, and surf the web. I never thought that a company like eCampus.com would care enough to give this away. They definitely have my business for life." eCampus.com provides an easy and fast way for students to sell their used textbooks through a simple 3 step process. Students enter an ISBN number, get a quote, and print a shipping label all at no cost to the student. Once the book is received and processed, students are issued payment through one of their payment methods: check, electronic funds transfer, or store credit with an extra 20 percent. According to Matt Taylor, director of Internet Marketing at eCampus.com, "After seeing such a large response from our iPad giveaway we have recognized this as a great way to connect to our customers. Stay tuned as we are planning another big giveaway for the back-to-school season." In preparation for the fall semester, eCampus.com, a leading internet textbook retailer, has unveiled an enhanced web site that will make it easier and faster for college students to rent, buy and sell textbooks. The new web site is optimized to allow a student's shopping experience to be seamless, whether renting, purchasing or selling textbooks. With enhanced navigation, better product recommendations and the addition of social sharing tools, eCampus.com continues to position itself at the forefront of the textbook industry. "The decision to revamp the website was largely driven by our focus on giving students the best possible experience when renting, buying, or selling their textbooks," said Matt Montgomery, President and CEO of eCampus.com. "Our commitment to our customers is to be the best source for a student's textbook needs. This means offering the fastest, most secure, and most seamless process possible." The web site also features an updated help desk, which includes a compilation of customers' most frequently asked questions during the company's 11 year history. The DVD & Blu-Ray section of the site now highlights new releases, staff picks, Blu-Ray selections and bestselling DVDs. Not only has eCampus.com revitalized its website in preparation for the fall semester, but it has also expanded its textbook rental catalog and added a brand ambassador program called eCampus Entourage. Both are steps toward eCampus.com's mission of giving students the best selection at the lowest price. eCampus.com is proud to introduce the eCampus.com Entourage, a brand ambassador program aimed at providing cash rewards to students for doing what they do anyway – buying, renting and selling textbooks. Students sign up for a free account and are given a unique code to use at eCampus.com. Each code is good for a 5% discount on all purchases and rentals as well as a $5 bonus when selling books back to eCampus.com. Ambassadors are encouraged to build their own entourage by sharing their unique code with friends who will then receive the same benefits when placing orders. For every rental order placed with their code, the ambassador will receive a $5 referral bonus. The larger an ambassador's entourage, the greater the earning potential. Montgomery continues, "We know our customers are always looking for easier, faster and cheaper options for their textbooks. Now, by joining the eCampus.com Entourage, students can earn cash and other rewards on top of the savings already offered at eCampus.com. And by providing students innovative social sharing tools on eCampusEntourage.com, we make it even easier for them to grow their own entourage." eCampus.com is the only textbook provider offering new and used textbooks for purchase as well as textbook rentals and downloadable eTextbooks. Entourage coupon codes will be good for all textbook purchase options as well as on a large selection of DVD and Blu-ray titles as well as collegiate merchandise. eCampus.com Wins the Battle Against High Textbook Prices With "Rent and Return"
eCampus.com, the nation's leading full-service discount textbook superstore, announces yet another exciting new weapon in the battle against high textbook prices! eCampus.com now offers the "Rent and Return" program on thousands of textbook titles. eCampus.com has long been trusted to offer the most complete selection of new and used high school and college textbooks, reference books and etextbooks available on the net. Now they can boast the widest variety of purchase alternatives including purchasing new textbooks, used textbooks and etextbooks directly from eCampus.com, purchasing new and used textbooks from an eCampus.com Marketplace Supplier or not buying the textbooks at all. The "Rent and Return" program provides an inexpensive alternative to purchasing textbooks. And more importantly, because of the comprehensiveness of the eCampus.com textbook list, thousands of the most popular textbook titles in America have been added to the "Rent and Return" Program. The eCampus.com "Rent and Return" Program has been designed to be simple, with easy to follow instructions and flexible rental periods to fit the needs of any student. As President and CEO of eCampus.com, Matt Montgomery describes it, "Just follow the four R's; Rent, Receive, Read and Return. 'Rent and Return' is the easiest way yet to save big on the textbooks students need!" At the end of the semester, returning the rented textbooks is easy. Students simply go to the Return my Rental page, follow the instructions and print off the free UPS return label. As long as the book is returned in good condition, there are no additional charges or hidden fees and eCampus.com pays for the return shipping! "'Rent and Return' is the best way to save a bundle on textbooks you'll never open again after the semester ends!" 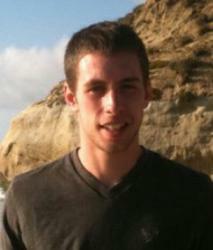 emphasizes Matt Montgomery. But for students who would rather buy their textbooks, eCampus.com will more than likely buy them back; eCampus.com still runs one of the best textbook buyback services in the industry. And their buyback program offers free UPS shipping as well. So, whether students buy or rent, eCampus.com remains the place to shop for the best deals on textbooks. eCampus.com, one of America's first online textbook retailers, proudly announces a groundbreaking partnership with digital textbook giant CourseSmart. This partnership will give eCampus.com customers access to CourseSmart's massive digital library of eTextbooks. By partnering with CourseSmart, eCampus.com will be able to offer students an environmentally friendly opportunity to save money on textbooks. eTextbooks are becoming an increasingly popular alternative to traditional textbooks for students seeking cheaper books and faster access to study materials. eTextbooks save students money by offering lower retail pricing through the elimination of the shipping, physical, and environmental costs associated with traditional textbooks. The partnership between eCampus.com and CourseSmart offers consumers the ability to obtain nearly instant access on an ever growing selection of eTextbooks. "With over 4,000 of the best-selling textbooks available, CourseSmart provides a new choice to millions of college students who will now find that their assigned textbook is available as an eTextbook", said Sean Devine CourseSmart CEO. "Our partnership with eCampus helps support our goal of providing this choice to students wherever they are shopping for their course materials." eCampus.com CEO Matt Montgomery states, "We at eCampus.com are proud to be working with CourseSmart to provide quick easy access to the largest single collection of eTextbooks in existence. This is another in a long line of firsts for eCampus.com, dedicated to providing America's students with the best variety of low-cost educational materials. I believe that this partnership positions eCampus as the best stop for college students to find new, used, and now electronic textbooks"
CourseSmart eTextbooks through eCampus.com will be available by August 2008. By incorporating a simple, down to earth approach to purchasing and downloading, CourseSmart and eCampus.com have created the most natural eTextbook shopping experience on the Internet. Now When Students Sell Their Book Back, They Get Paid Much Faster! eCampus.com, an industry giant in online textbooks sales, is introducing direct deposit for students who sell their book back through www.eCampus.com's online buyback program. These students will have the option to enter their bank account and routing numbers when selling books back, enabling them to be paid directly into their bank account and eliminating the wait that comes with physical checks. eCampus.com is dedicated a quality customer experience. Customer satisfaction is their number one goal. The most recent example of this is the new alternative payment method student may use when selling their books back at the end of the semester. On May 22, 2008, eCampus.com launched a direct deposit payment option, allowing students to get paid faster. Students will enter their bank account number and their routing number so eCampus.com can pay them directly into their accounts, effectively eliminating the up to 4-6 week wait to receive their checks through the mail. "Last year, eCampus.com became the first major online bookseller to offer free UPS pre-paid shipping for all used books sold back through our buyback program. Now, with the additional enhancement of direct deposit, no one will get students their money quicker", stated eCampus.com's CEO Matt Montgomery.